Your home's ductwork deliver heated or cooled air to every room. Sometimes, problems occur within the ductwork system that if not repaired can waste your money, and result in a less comfortable home and could even lead to illness. Here are some signs that your ductwork needs attention. Leaky or disconnected ducts. The largest duct-related problems are leaks (from holes or tears) and disconnected joints that allow heated and cooled air to escape into unoccupied spaces, such as the attic, garage or crawlspace. Uninsulated ductwork runs through unconditioned spaces. Heat loss and heat gain occur when ductwork passes uninsulated through the attic, garage or crawlspace. Heat transfer results in significant energy losses that raise your heating and cooling bills. All you need to fix this problem is to install insulation around well-sealed ductwork, and you’ll keep heated and cooled air where it belongs. Airflow problems. If air flowing from any supply vents feels lukewarm, or there doesn’t seem to be any air flowing at all, your ductwork needs attention. Inadequate return ducts. In some homes, leaky joist spaces are improperly used to channel airflow. Other homes have no return ducts at all, forcing HVAC equipment to consume more energy to keep the home comfortable. 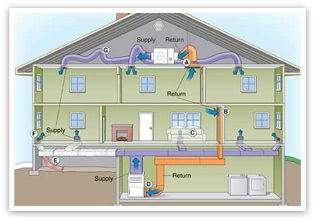 The lack of a return duct system can also depressurize the home and give rise to health hazards. If you find that any of these troubling signs apply to you, your ductwork needs attention. Be sure to leave any duct changes or repairs in the hands of a qualified professional. Thanks for sharing this article, It's great help for those who need this kind of service,It's very important for the customer to know whether the company has taken its high-quality service.